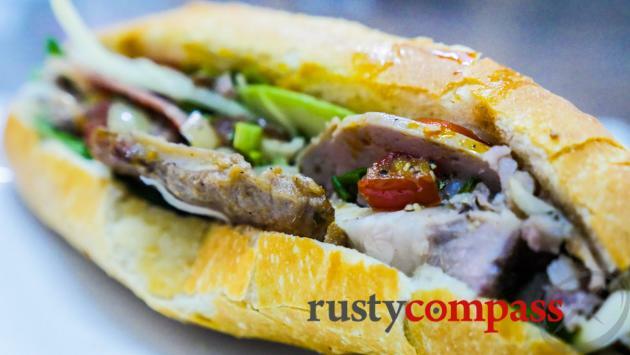 Banh My Phuong is a delicious Vietnamese sandwich stall in Hoi An, that’s been catapulted into the limelight by an endorsement from Anthony Bourdain who passed away in 2018. It's become so popular that the queues were stretching way down the street during my recent visit. It's good but we're not sure about waiting that long. A visit by Anthony Bourdain could be a very big thing in the life of a restaurant. I’ve seen the Bourdain phenomenon at work on several occasions in Vietnam. 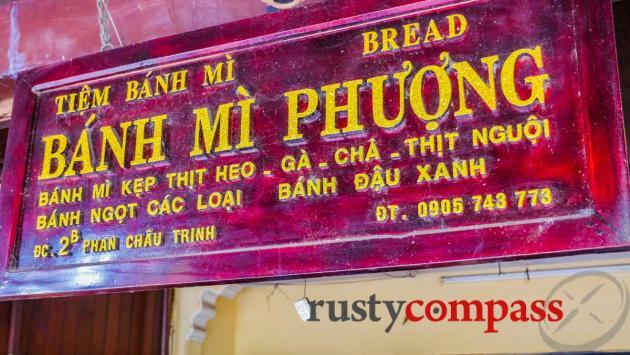 In Hoi An, his endorsement of a little banh my cart has propelled Mdm Phuong to great fame and underwritten Hoi An’s most popular sandwich (banh my) stop. It's possible that Bourdain's untimely death in 2018 added further momentum to the Mdm Phuong banh my juggernaut. The good news is, that Mdm Phuong hasn’t let fame go to her head. She’s a delightfully friendly host, her banh my is as delicious as ever, and despite now offering a restaurant space, the price is still right. Phuong is a Hanoian who, as a young girl, moved to Hoi An with her family after the Vietnam War in the 1970s. 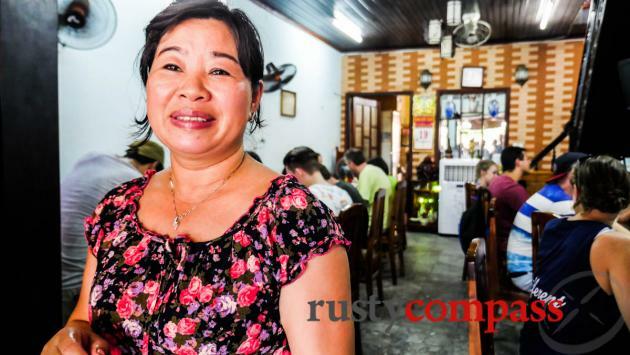 In 1989 she started selling banh my to supplement her income as a teacher. These days her banh my cart has morphed into a restaurant, with a production line churning out an expanded menu of 12 sandwiches - many of which have been tailored to the tourist palate. I’m guessing 2 of the twelve options would have made an appearance at the original banh my stall - the “everything” and the pork and pate. Don’t be surprised to find yourself in a queue. On our most recent visit in October 2019, the queues were getting a little too long. We love this banh my but there are plenty of other options around town that ain’t bad either. 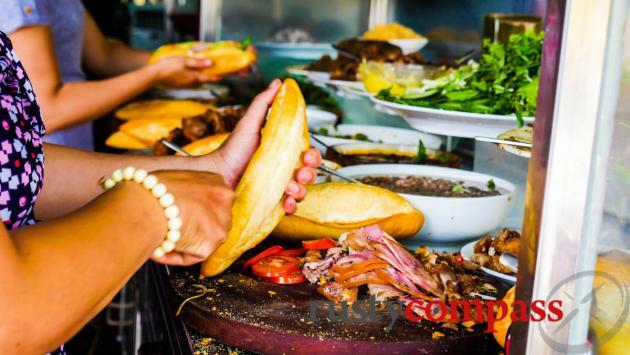 I’ve frequently asked Hoi An locals what they make of the Banh My Phuong phenomenon. They say Phuong’s rolls are fine. But they’re disinclined to anoint any stall as the best in town. 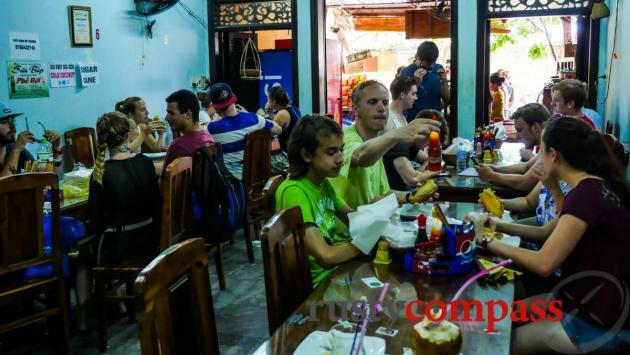 The deluge of foreigners means that locals are less conspicuous at Banh My Phuong these days. Banh My Phuong still has a simple stall on the eastern (Cua Dai Beach) side of Hoi An’s central market. Phuong is more likely to be found at 2B Phan Chau Trinh. Rusty Compass reviews are always independent. We list the stuff we think you should know about. That’s it. We’ve always paid our way at Banh My Phuong and no inducement, financial or otherwise, was received for this listing.